Welcome to the next segment of our 2019 #TravelTuesday series: Travels with Grace. Today Grace returns to San Francisco. 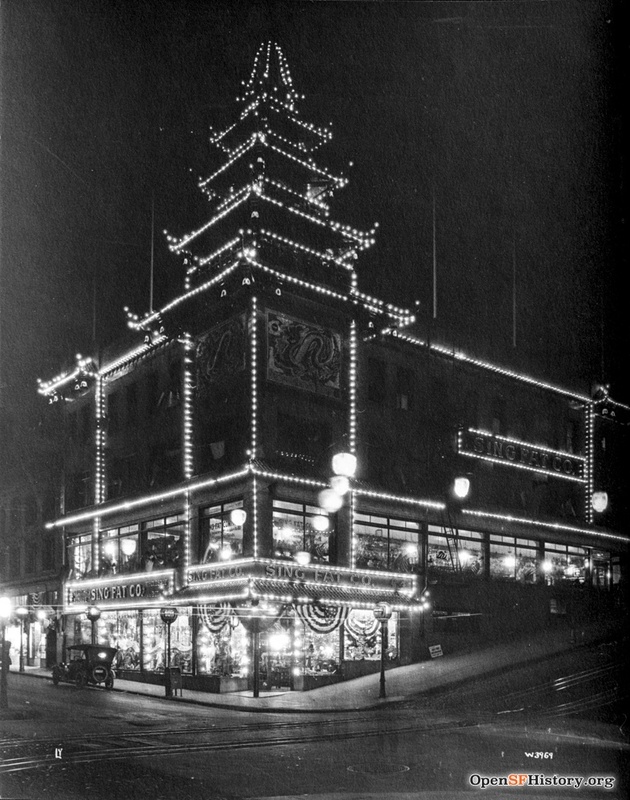 Sing Fat Co. building illuminated, c. 1920s. Courtesy of OpenSFHistory. July 22, 1924: They welcomed us back to the Whitcomb most cordially. This morning we did some necessary shopping at the Emporium, a very fine store. Then went to Chinatown where we went thru Sing Fat’s, a most interesting Chinese bazaar and made a few purchases. We walked up the street for several blocks and went in a number of shops to look at the lovely ivories, china, lacquer and inlaid furniture, embroideries, rugs, bronzes, mandarin suits and very odd jewelry. Had supper at the Grand View Hotel, a most attractive Chinese restaurant but I didn’t care much for the Chinese food. From what I have seen of the Chinamen here they are very polite and painstaking, not evincing the slightest disappointment when one doesn’t buy and seem most efficient as servants. 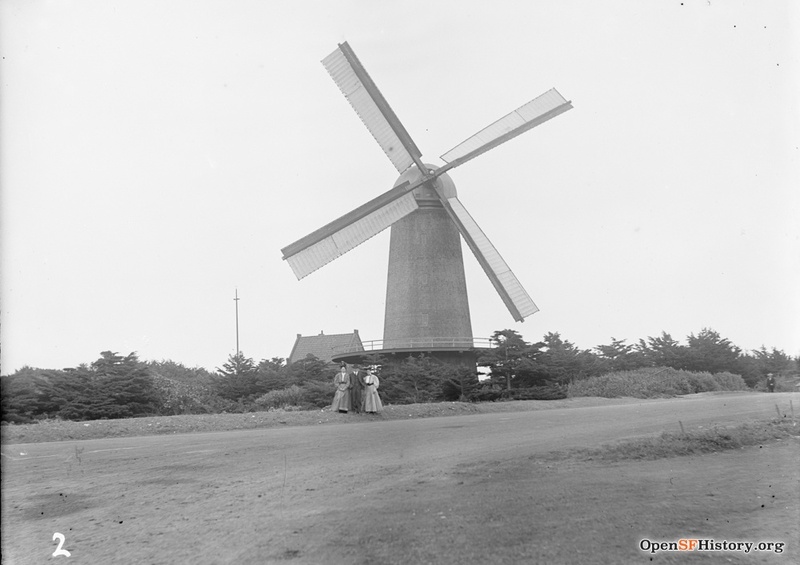 Dutch Windmill, c. 1910. Courtesy of OpenSFHistory. July 23, 1924: Took a ride thru Golden Gate Park today, a wonderful park considering that it is artificial, all laid out by the hand of man. There are beautiful trees, shrubs and flowers, on the beach side there are the queer shaped cypress trees like we saw at Monterey, looking like the wind and blown and twisted them in its fury and they have remained thus deformed, dead on the side where the cold ocean breeze strikes them and green on the inner or sheltered side. There is an old Dutch windmill used for pumping up the water to irrigate the gardens. A beautiful dome arch or pergola still stands, a solitary survivor of the earthquake. We saw the buffalo and deer, the lake full of ducks and black swans with red bills swimming around us dismayed by the row boats that skim past them. We went in the aquarium and saw some [???] specimens of fish, shells, turtles and water reptiles. Watched the sea lions being fed. Then walked to the Japanese Gardens, set off from the rest of the park by a high wall and looking like a transplanted bit of old Japan with its bridges, streams and little waterfalls, dwarf trees, flowers set out in oriental pots, temples, bells, pagodas, bronze mythological statues, etc. We had tea and rice cakes in the tea house served in the Japanese style. In front of the garden is a fine large Spreckel’s band stand with hundreds of seats beneath straight rows of low handing shade trees. For dinner we went to Marquard’s where we saw a pretty good cabaret. 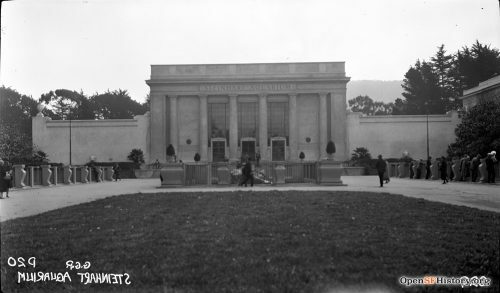 The Steinhart Aquarium, Golden Gate Park, July 1, 1926. Courtesy of OpenSFHistory. July 24, 1924: Went to the Fairmont for dinner tonight and spent a very pleasant evening with Mr. and Mrs. Irving Wiel (Cousin Elsa) and their son. “The Casa Del Rey Hotel, 300 modern rooms of hospitality located in a Spanish garden at the beach in Santa Cruz, California” – postcard, c. 1928. [Santa Cruz Public Libraries]. 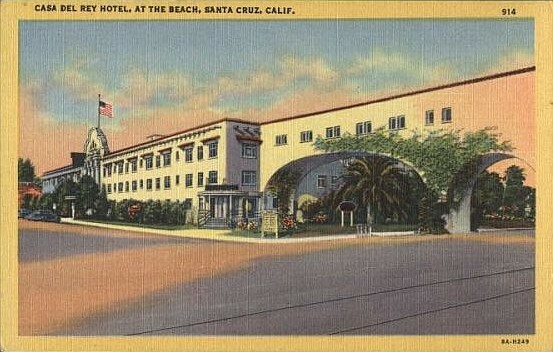 July 25, 2924: Left on the stage at 9:30am for Santa Cruz stopping en route at Los Gatos a pretty little county resort and arrived at Santa Cruz at 12:45. The ride was very interesting as we went thru numerous little towns and the road wound up the mts. affording many lovely views. Took lunch at the Casa del Rey (Santa Cruz’s leading hotel and quite an attractive one) in a sunny dining room surrounded by an open court full of hydrangea bushes. After lunch we strolled about the casino, a sort of midway built out on the beach. It was an animated sight to watch the bathers, water craft and hydroplanes, the various concessions along the little boardwalk. It is a popular resort for the middle class. There is one of the finest indoor pools here that I have even seen. At 3:00 P.M. we again took the stage and arrived back in San Francisco at 6:15pm. Found a lovely box of candies in our room from Cousin Elsa. Tonight we listened to a fine concert at the hotel. At my request Mr. Ben[?] played the Scheherazade Suite from Rimsky-Korsakov. 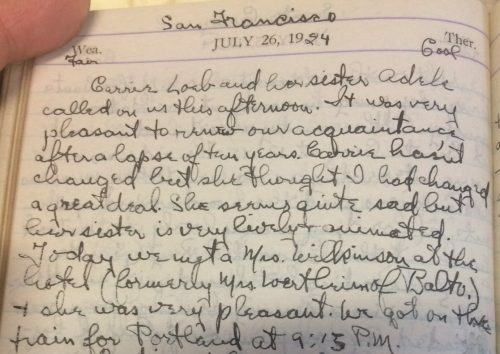 July 26, 1924: Carrie Loeb and her sister Adele called on us this afternoon. It was very pleasant to renew our acquaintance after a lapse of ten years. Carrie hasn’t changed but she thought I had changed a great deal. She seems quite sad but her sister is very lively and animated. Today we met a Mrs. Wilkinson at the hotel (formerly Mrs. Loerthrn??? of Balto.) and she was very pleasant. We got on the train for Portland at 9:13 P.M.